With Ackermans Cellular, be in touch when you choose a cell phone. They offer you everything from smartphones to airtime and devices that use low levels of data. 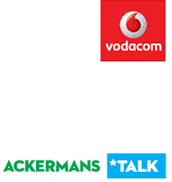 With all the major cellular service providers now availabe at Ackermans, you can connect for less with Ackermans Talk. Get cellular Deals with MTN, Cell C, Telkom and Vodacom. Whether you are looking for the trendy tablets to the latest Samsung Galaxy Devices, be in touch with Ackermans Talk.